During all the years I have been doing cross stitch I finished a lot of projects, some quite big and another really tiny. In the next posts series I will show the most important project I have finished, divided in to Small Projects, Medium Size and Large Projects and Other Crafts Projects. Today I want to write about my small projects. I have done really a lot of small projects, some for myself and other for sending in the swaps I have participated. I am going to show you only those ones which have a special significance for me (all my jobs have significance for me obviously; the ones I will show are special for some reason or another). Even if I was doing cross stitch from very early stages of my life, I had never finished any of my projects before 2011 and that is the reason why I mark that date as my real embroidery starting point. 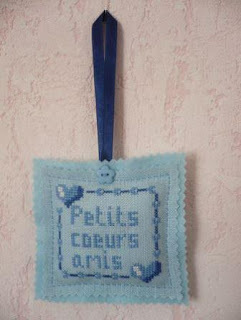 The first job I finished was a small design called Petit Coeur de Amis. I did in green Aida 14 count with greenish threads and I did as a door handle hanger. I was amazed with the small Petit Coeurs and I decide to continue working in that line. I have always like more the, let’s say, 3D embroideries than the flat ones, even I have also done plenty. I did a simple FOB with a very easy design but which served me to learn the “biscornu joining” technique, as I call it. After making few FOBs and similar projects it was time to try my first biscornu. I choose a gourmand design and I joined it using the technique I was training with the FOBs. The result wasn’t so bad to be the first….. When Christmas time came I decided to make a pinkeep ornament. The design was the obvious for that time of the year, a Christmas tree. I will prepare a tutorial about pinkeep making in the next future to share with you. That is all for the moment. In my next post I will talk about the medium size projects I have done from 2011. See you soon and have a good embroidery time.